Ok, so do you remember meeting Ms Gluten-Free Machine, Lorna Foreman? Is it our environment? Is it natural in humans? What is causing this increase? For now, cancer is threatening, it is a disease which takes lives easily, it is the stark truth of the matter. While we wait for a drug to be made which will forever eradicate the fatality associated with it, we have to take care of ourselves and promote and encourage our community to as well. This is why I am so proud to be hosting Ms DE, who is promoting this through her wonderful new book, Top Ten Superfoods For Preventing Breast Cancer. Patricia, you are such a fine example to us all. Combatting a disease so strongly and then taking your experience and using it positively to enlighten others and enrich their knowledge. Putting in the effort after an illness takes courage to write an incredible book. With so much experience in talking, explaining and teaching about cancer, and working with clients who have gone through this trauma, I think I speak for us all when I say her book is metaphorically made of gold, containing a lot of useful, first hand information. Let’s check it out shall we? Not to mention this book also contains a 7-Day meal plan to get you started on a healthier lifestyle! It is so exciting to meet someone so passionate about changing the world no, one disease at a time! I won’t keep you much longer, who needs to hear me chatter on when you could be enjoying an exclusive guest post by my guest on her virtual tour! When it comes to cancer, I strongly believe the best way to cure cancer is to prevent it. However, organizations are not focusing on true prevention. To them, prevention means making sure you get your routine mammogram. While this may help some, research has shown these tests can also create more false-positives and unnecessary treatments. The truth is that by the time a tumor is detected in a mammogram, it has been growing in our body for anywhere from 2 to 5 years. More importantly, these snapshots in time do very little to address the real question – ‘Why is cancer developing in the first place’? After my own diagnosis with Stage II breast cancer, I began a personal journey to try and determine what I could change in my surroundings to help prevent this disease from striking again. This journey led me to become a nutritionist and, then, to eventually write my book, The Top Ten Superfoods for Preventing Breast Cancer. My intention was to share, not only my personal story, but to also help anyone interested in arming themselves against a deadly disease, that despite our best efforts, continues to claim thousands of lives each year. Food is power. The fats, carbohydrates and proteins we consume on a daily basis, can have a profound effect on how our body functions and how it fights disease. This battle happens on a cellular level, where diseases such as cancer begin. Fighting cancer is a war we can win, but it will require a paradigm shift and an embracing of some old truths. One being that food truly is medicine and our medicine is contained in our food. To make cheese, place garlic and salt in a food processor and process into small pieces. Add cashews and continue to process until consistency is like a paste. Add lemon juice, cilantro and water and continue processing until contents are smooth-like, but not watery. Set aside. To make walnut meat, place all ingredients into a cleaned food processor and process on pulse until mixture looks like ground meat. Layer the cheese and meat down the inside of a lettuce leaf. Top with salsa and cut avocado, wrap and serve. This is a delicious twist on a classic dish. The spices cilantro and coriander are high on the list of healing herbs primarily for their anti-inflammatory properties, while cumin seeds contain free radical, anti-cancer properties. Cashews have lower fat and higher protein content than most other nuts. Additionally, the oleic acids from the nuts, a monosaturated fat, are known for their cancer-protective benefits. Garlic is an infection fighter and its anti-microbial properties have been shown to offer protection against certain types of cancers. Finally, the white part of the lemon has been studied for their anti-cancer properties. This makes this recipe a power-packed cancer-fighting meal. Haven’t Had Enough of Patricia? Or follow her virtual blog tour! With two different ways to win a copy of this book, I certainly do wish you all the best! I do encourage you to enter, winning could mean recipes beyond your dreams, all with wonderful health benefits! Haha, ok maybe not totally but it is a HUGE annual charity run in which all the volunteer heroes (yes, they are all heroes) work to raise money for a cause close to their heart. It is beautiful is it not, to support someone in this cause? I wish I could say I was doing this run, but it clashes by being exactly at the same time as my major finals (eeyuck no?) so unfortunately I am unable to compete, but please, check it out, sign up, find people who are running and sponsor them as much as possible – it is all for a good cause, no matter what you support. Thank you for sharing this Uru- I am a strong believer that diet plays a huge role in our overall well being with the capability of reversing or placing chronic illness in remission! I was just thinking the other day…I don’t know anyone who has not had a death from cancer in the family. This is a great post. Thanks so much! Great to meet you Patricia and great job Uru. Guest posts such as this one are “more” than a guest post — they’re a public service, an education, a motivation to pay attention, and a new way of looking at food. (Not to mention a tasty sounding recipe!) Thanks, Uru, for introducing us to Patricia, and thanks, Patricia, for sharing what you’ve learned! Hi Kim. Thanks so much for your wonderful comments. I’m glad you enjoyed the post. Wow Uru, you did a great job with this post my friend. Awareness is the most important thing, especially when it comes to health. Thanks for spreading the word! Hi Paula. thanks for your comments. Most of us have someone close who has cancer. I firmly believe nutrition plays a big role. The healthier we eat, the better our health will be. Unfortunately, it’s not the only answer, but we should all take Patricia’s advice. Thank you for your comments. So true, nowadays, we are all touched by this disease. Hi Kay. Thank you for your comments and for reading my post. I wish all of your loved ones well. What an interesting post and a lovely introduction to Patricia! Thanks for sharing, Uru! Hi Georgia. Thank you for your comments. I am so so sorry my friend. It is my pleasure to spread information about such an important topic. Thank you for your comments. I am truly sorry about your daughter. Inspiring to read about Patricia! And that was a whole lot of useful information Uru. Diet is so very imporatnt to our well being. Wish you luck on your incredible journey Patricia! another great giveaway!! cancer awareness is sooo important. Thanks for this!! What a warrior Patricia is! LOVE! Hi and thank you for your comments. I’m glad you enjoyed the post. This is a different taco. I don’t think tacos are suppose to be near this healthy. 🙂 Actually, I love every thing about it. All of the nuts and then the avocado – delicious! Nice to me you Patricia! Hi. I think you will LOVE the recipe. Now this sounds like my kind of recipe! I did actually make some walnut taco “meat” just this past week, although I used traditional soft corn tortillas as vessels. 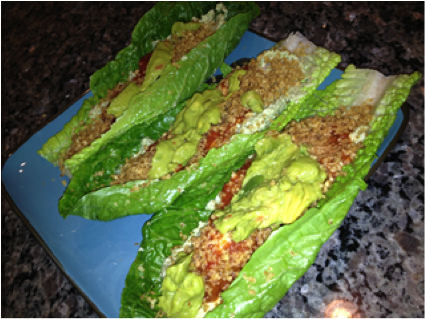 The lettuce wrap approach will be perfect for the height of summer though- Much lighter and more refreshing. Thank you for posting my fundraising page! Thanks also for raising awareness of this terrible cancer. It was great to hear about Patricia’s journey. I will definitely be buying a copy of the book for my nan who is battling breast cancer, and whos name also happens to be Patricia! Hi Chelsea. Thanks so much for reading my post. I my best wishes to your nan. I hope you win this copy my friend, best of luck to you and your nan! We should pay more attention to what we put into our mouth. Uru, thanks for introducing us to Patricia. Hi Norma. I agree. Food is powerful. Thanks for your comments. What a delicious sounding, healthy recipe, i love the idea of the cashew cheese and walnut meat!! YUM! Food is truly amazing! Wow Uru thanks for putting together this great great post and its wonderful that you are making a.difference through your blog. The cashew cilantro cheese sounds so interesting! Cashews do have a creamy texture when ground- didnt know it could be a cheese substitite! what a special post! information like this should absolutely be more well known. the tacos sound great, and that’s coming from a die-hard omnivore! Hi Grace. Then that’s a true compliment. Enjoy! Patricia sounds like an amazing lady. The book sounds great. She’s very inspiring! Hi Suzie. Thank you for your comments. This was a very nice post addressing a very important topic! Thanks for sharing! thanks for your comments. I’m glad you enjoyed the post. Uru, Thank you for introducing Patricia. Very informative and valuable post. Hi Fae. Thanks for stopping by. Thanks for the great reading and for the giveaway as well. I am one who fought cancer with foods and I’m six years cancer-free at this point. Way to go Ruby. I LOVE to meet a fellow survivor. Scary to read about cancer but is becoming so common these days. Lost many people in my family due to their suffering from cancer. It was knowledgable to read about how to prevent or outcome cancer and I have to agree that incorporating veggies and fruits into our diet is so important. Thanks for bringing this amazing woman and her work to my attention! Hi Tea. thanks for your comments. I hope you enjoy the recipe! Long post, yes, but well worth the read. Great post with lots of good information. Hi Eliottthecat. Thank you for your comment. I have liked your fb page Uru ages ago! Interessting health book for sure. I like the Cilantro-Cashew Cheese recipe. never seen one like that. So is this giveaway world wide? Hi Helene. This recipe is one of my favorites, and yes, the giveaway is world-wide so please enter. I love the idea of fighting cancer with food!! Such a great post. Hi Joanne. Thank you for your comments and reading my post. I’m really impressed by her determination and would love to be able to win a copy of that book. Hi Mich. Thank you for your comment. Please enter and good luck! Hi Three Well Beings. Thank you for your comment. The recipe is very versatile. You can also use the cilantro cheese as a topping on dehydrated bread for snacks. CCU, what a remarkable woman you brought to our attention, Patricia sounds like such an incredible inspiration – how wonderful. Cancer is such a complex and all too often very sad and painful disease which affects the individual and family for an uninvited life altering shift into a direction which can be so heart wrenching. Thankfully there are special people like Patricia to help. Hi Mandy. Thank you for your comments. You are right. Cancer is complex, but I believe it is a battle we can win. Thanks for all the great tips from Patricia. Cancer has taken away my mum and afraid that it will happen to me too. Hi Zoe. I’m so sorry to hear about your Mum. I believe you will be fine. With blogs like this, that seek to empower and inform, you are doing all the right things already. Hi, and thank you for your comments. This is a subject very close to my heart! Well said Patricia,Food is the power. 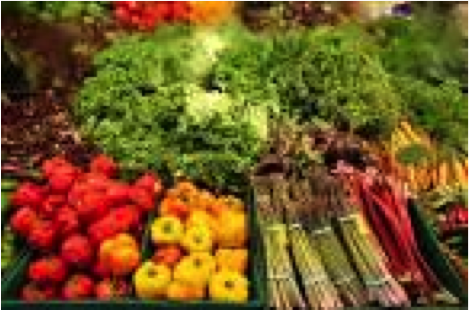 Eating the right healthy food and keeping a healthy lifestyle is the key to prevent cancer. The recipe of tacos is very interesting. I would like to know what is Liquid amino acid? Is there any substitute? Hi Balvinder and thank you for your comments. The amino acids is by a company called Braggs. It’s a liquid protein concentrate, non-GMO. It contains the essential amino acids our body needs. I’ve included the link. Great post and nice to meet you Patricia. I teach classes at our cancer support community here in town and recently taught one on raw food. While researching the topic myself i was amazed at how many survivors claim their remission was all due to their raw food diet. Whether raw food or not, healthy eating and exercise is proven to ward off cancer and many diseases. It surprises me how many people still don’t follow a healthier way of life. Hi Vicki. Thank you for your comments. What a wonderful thing you do. It must be so rewarding. I credit diet and exercise to my recovery and believe it is the key to prevention. 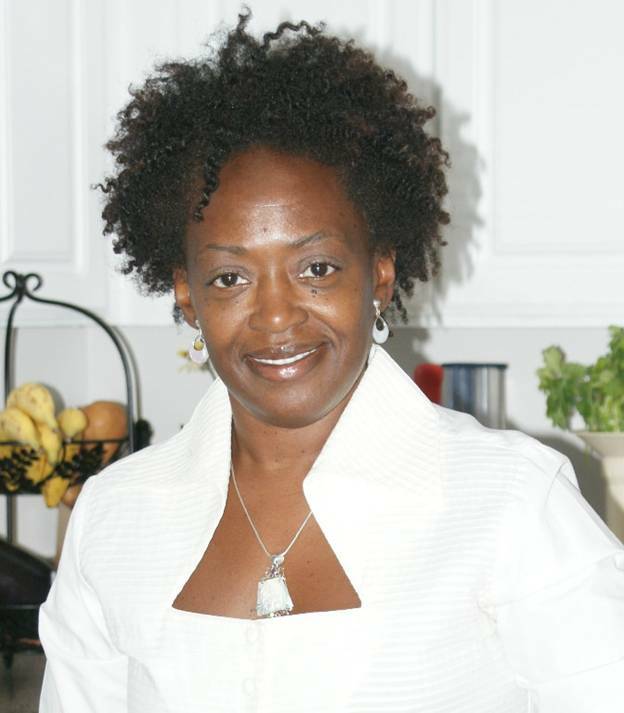 A touch journey, Patricia…I am so glad that you have conquered the big C and getting so well. Thank you, Uru, for sharing this. The lettuce boats are looking so good! Hi Angie. thank you for your comments. I believe you will really enjoy the recipe. Hi Lorraine. thank you for sharing. It is true, what we eat affects us on a cellular level. Hi Laura. Thank you for your comment. I so glad to her about your mother’s successful recovery. Lovely to meet Patricia and hear of her journey. A good diet is the best medicine. Hi Maureen. I totally agree! thanks for your comments. Good to meet you, Patricia! Important post – so nice of you to take the time to write it. And great looking taco wraps! It’s wonderful to meet you Patricia, thank you for helping us to lead a healthier cancer free life. My Mom and sister are breast cancer survivors and I am going to order your book and send it to them. Great post Uru, we have to eradicate this deadly disease. Hi, and thank you for your comments. Congrats to both your Mom and sister. I wish them well. Great post, I am glad that I read it. Hi Marta. Thank you for stopping by and posting. Hi. Thank you for your comments. I’m glad you enjoyed by post. Best Wishes. It’s a pleasure to meet you Patricia and thanks for the work that you do. Hi Sandra. thanks for reading my post and thank you for your comments. Hi Jonathan. Thanks for the resend! Thank you for this post. I am a breast cancer survivor as well, and I do believe diet can help prevent not only cancer but many other diseases and conditions. Hi and thank you for your comments. I TOTALLY agree! On behalf of Patricia and Book Marketing Services, I would like to thank you for hosting Patricia today on Go Bake Yourself. She is excited to be here. If anyone has any questions and/or comments they would like to share with Patricia, please leave them in the comment box. Patricia will be by later in the day to respond to everyone. 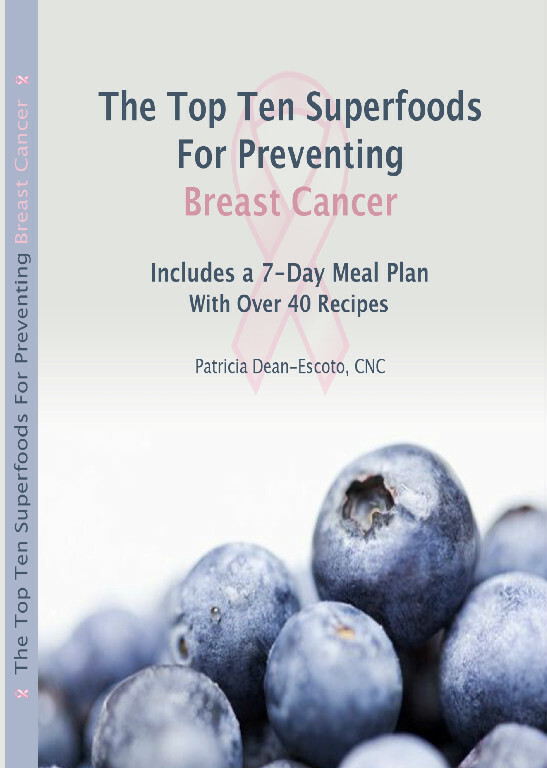 Please enter the giveaway to win an autographed copy of The Top Ten Superfoods for Preventing Breast Cancer plus a 30 minute consultation with Patricia and a 3 day meal plan. 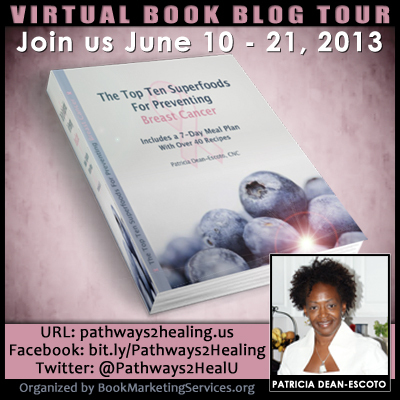 Click on the Rafflecopter link that Uru provided or go to http://www.pathways2healing.us/virtual-book-blog-tour/.